Forget the big and tough 4WDs if you want to know where the sales action is in the SUV market. While large 4WD sales have dwindled to a drip feed, the small/medium SUV market is the biggest SUV sales segment of all, and one of the major volume segments in the Australian vehicle market. Not only are medium SUVs taking a bigger slice of sales, some of them are beginning to offer a decent towing capacity. The new, third-generation Mitsubishi Outlander we’re testing here is a prime example. It has a 2000kg towing maximum, with 200kg download permitted on the towball, up from 1600kg/160kg on the V6 model in the previous series. This is encouraging news, as the majority of similar vehicles on the market offer barely more than 1500kg towing maximums (and often not even 10 per cent ball load). 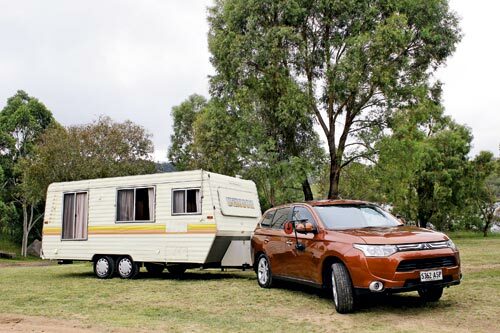 Even though the Outlander is not even close to LandCruiser or Discovery’s towing capacity, as caravan manufacturers become focussed on reducing caravan weights, the Outlander’s 2000kg/200kg capacities might one day be considered the caravan-towing norm. This is the first Outlander to offer buyers a diesel option. 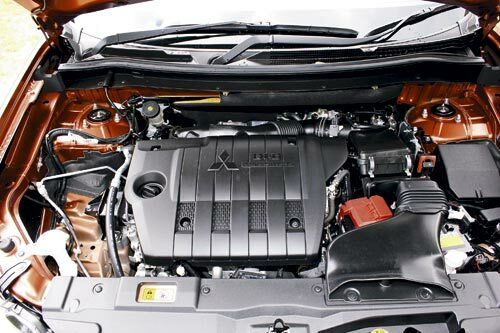 Kicking out the last generation’s petrol V6 as the premium Outlander engine, the 2.2L diesel is hooked up to a six-speed automatic as standard. Much of the second-generation Outlander’s floorplan continues, but the suspension and body are new. The exterior design abandons the signature ‘shark nose’ look of recent Mitsubishi models, featuring more divisive styling cues. The Outlander Aspire we tested is the most expensive model in the range, which comprises an entry-level ES (in 2WD or AWD), middle of the range LS (AWD only) and the Aspire (AWD only). While entry-level ES comes with the 2.4L petrol engine only, both LS and Aspire offer the petrol engine or for $2000 more, the 2.2L diesel. 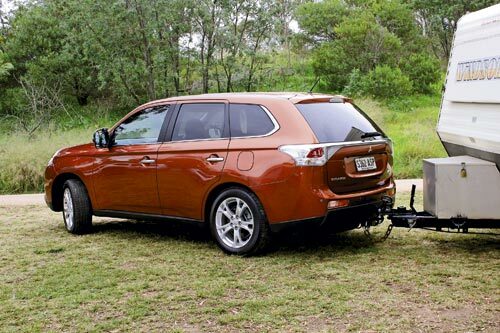 Mitsubishi claims that average weight in the new Outlander range is down 100kg, thanks to the use of lightweight steel. All Outlanders come with seven seats, and, while the new model has lost the useful horizontally split tailgate and 100L of storage capacity of the previous model, it gains more sophisticated features and a better level of finish. The second and third-row seats now fold flush. 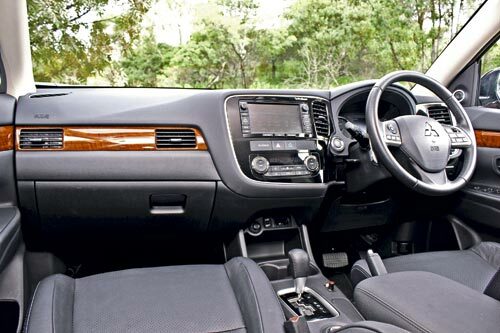 In the Aspire, standard features include cruise control, Bluetooth, auto-on headlights and wipers, leather seats, 18in alloy wheels, keyless entry and keyless ignition, heated front seats, power driver’s seat, reversing camera, dual-zone climate control, and trip computer. The Premium Pack fitted to the test vehicle comes with active cruise control, forward collision mitigation, power tailgate, Rockford Fosgate premium audio, 7in touch display and 3D mapping satnav. The Outlander affords the driver great vision – except for the rear quarter areas, where the mirrors and camera have to be relied upon. The instruments in the twin binnacle are clear and simple, as you’d hope they would be. Ancillary switchgear is pretty straight-forward to operate, too. The front seats are supportive and a few hours’ touring will not have you shifting around in the seat. The second row has plenty of room and the seat is well contoured. The third row is not big enough for anything but pre-teen children and unfortunately the 1/3 split fold in the second row seat is on the traffic side. This means that two second-row passengers have to get out to allow third-row passengers in on the safer, kerb side of the vehicle. The 2.2L turbodiesel is new, and it employs some extra features to aid efficiency over the previous model Outlander. Called Eco Drive, this new Outlander feature includes a dash light to signify the vehicle is being driven economically. 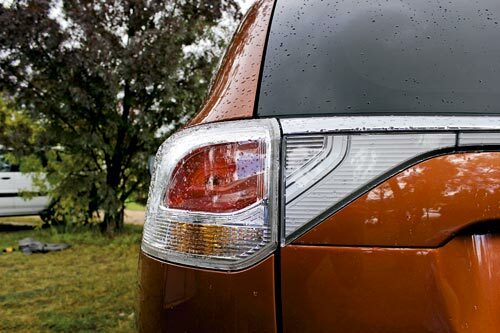 Another part of Eco Drive is to permit a fuel consumption reduction of up to 10 per cent. This is done by pressing the Eco button on the dash, which reduces engine power and the air-conditioning and AWD systems are set up to reduce energy use. The new diesel settles to a quiet idle and torque builds strongly from around 1800rpm to around 3500rpm. The engine continues to 4000rpm before the smooth six-speed auto upshifts. The diesel isn’t the most powerful or torquey in its class, but it does its job without fuss and with a petrol-like smoothness. Yes, you can hear the typical rattle and there is the characteristic turbo lag, but this engine is one of the sweeter diesels on offer. The MacPherson strut front and multi-link rear coil-spring suspension is quite conventional in design and is well tuned for Australian conditions. The ride is firm when driving around town, but with a load on board or once speed rises it doesn’t feel so abrupt, just quite firm and well-controlled. The steering feels nicely responsive to input but otherwise unremarkable in the SUV context. Reflected road noise from the tyres seems intrusive on coarse-chip bitumen but this is not unusual for low-profile tyres such as these. 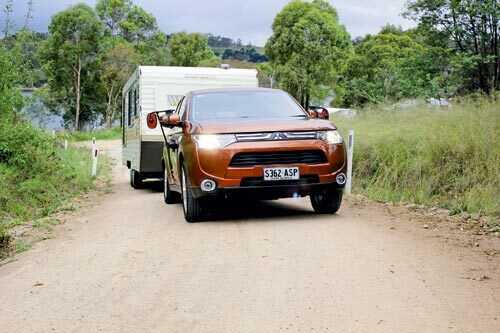 With a 1600kg full-size tandem-axle caravan behind, the Outlander achieved an average of 11.8L/100km. With a mix of easier, solo driving in the city and the highway, consumption averaged 8.1L/100km. 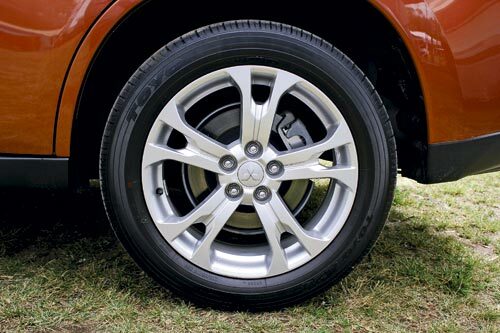 With 150kg on the towball, the Outlander’s front rose and rear dropped around 25mm. This is borderline for towing without a weight distribution hitch, but the point of this test is to find any instability the vehicle may suffer – an instability that would be masked by the use of a WDH. The good news is that up to the 100km/h at which we drove, it was a very stable tow vehicle. The test hill did make it lose some speed, but we were able to maintain 85km/h in a 90km/h zone climbing the hill. Engine braking is not as good as you would expect from a diesel, perhaps because of its free-revving nature. While its exterior design has polarised opinion, the new Outlander is clearly an improvement on the model before it, with refinements like the crash avoidance technology and adaptive cruise control, even though they are part of an expensive option pack. The loss of cargo space is a disappointment but the sumptuous interior, lighter body, the addition of the sweet turbodiesel and a boosted towing allowance create an appealing mix of talents for a city wagon and towing tourer.